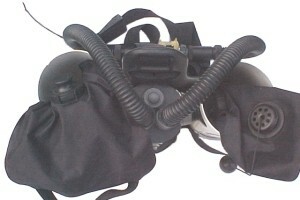 Three views of the R3P™ mixed gas backmounted dual counterlung rebreather. The scrubber fitted has a practical duration of around an hour depending on workload and depth. 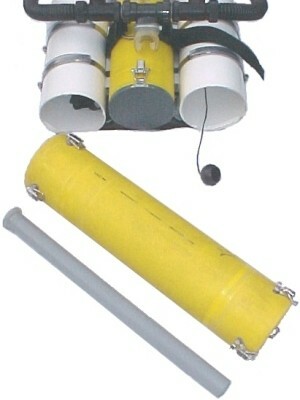 In an attempt to extend the duration a longer scrubber body and dip tube can be fitted. 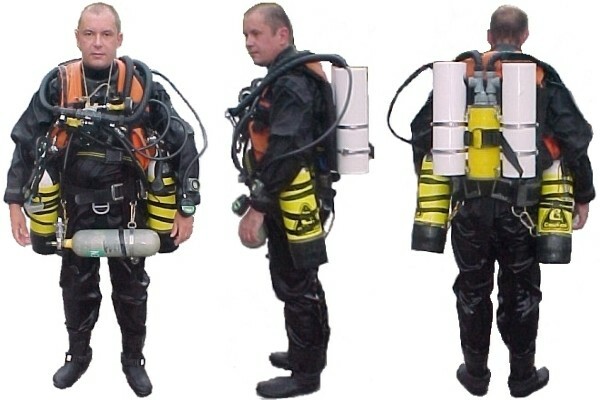 This holds twice as much absorbant and should be a more practical propostion for longer dive times. This inevitably adds to the work of breathing so the counterlungs have been split in order to reduce the flow rate through the scrubber. 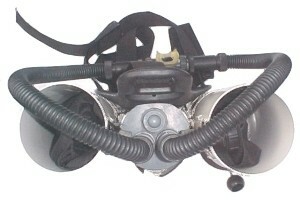 The first top view shows the dual counterlungs - made from Ortleib water bags - 4 l on the exhale side (left of picture) and 2 l on the exhale side (right). The counterlungs are protected in 125 mm i.d. pipe and have been pulled up out of these to show the P-connector in the inhale counterlung used to hold a single Draeger Oxyguage for ppO2 monitoring and a manual dump valve in the exhale counterlung (to be replaced by an overpressure valve). A front view of the unit attached to a AP Valves plastic backplate. As before, the drive gases are mounted offboard with manual feeds to the mouthpiece. 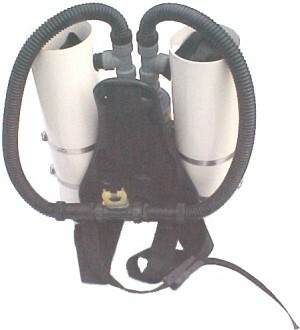 The R3P™ can be put on a AP stab jacket as shown above or removed from the backplate and chest mounted. A constant flow O2 addition system has been made but not installed. KISS-type needle valve O2 metered injection with manual bypass. The key components are a Swagelok B-SS4-A metering valve and a Clippard Minimatics MJV-2 bypass valve. An adaptor to attach to a standard BC hose and an isolation valve completes the workings.